← We build a custom gnu/linux powerpc Smartbook! Writing this post I hope to share something useful for you. I have wrote this post first on my italian blog . Now I have rewrite it here in my english…. Now to boot with the generated new linux kernel you need to create the references into /etc/yaboo.conf , you could copy the old paragraph and rename it in “new” and substitude the reference from initrd.old e vmlinux.old to the new installed initrd and vmlinux. At reboot when appear yaboot boot load you need to press tab and choose new option. The virtual disc now is not bootable with qemu and openbios 1.1 , I need to investigate a way to fix it. I have the solution provided from Richard WM Jones that is to extract vmlinux and initrd from the virtual disc thanks to the guestfish package that is not included in lubuntu/debian powerpc, so I was able to compile guestfish from source form the libguestfs website and even from the source package of lubuntu, but what I wasn’t able to prepare is the appliance with a qemu vmlinux and initrd runnable on powerpc architecture. 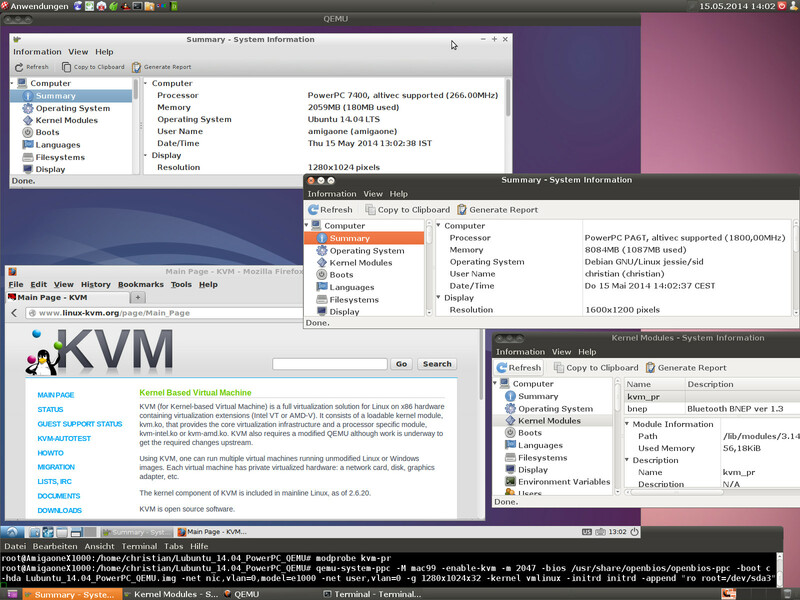 Now we can help testing different gnu/linux distro for powerpc on our powerpc G4 machines. Thanks a lot for this post. I was looking for a while which hypervisor is still working on a G5. That’s fine! I’m waiting my G5 to be fixed for doing the same, please update me. 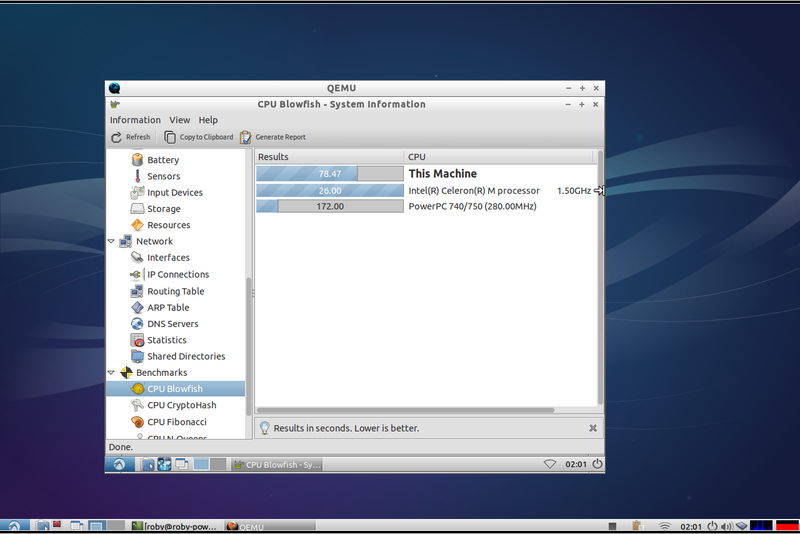 Lubuntu 14.04 PowerPC on QEMU with “PR” KVM enabled is faster on my PA6T PPC system than Lubuntu 14.04 PowerPC on QEMU on my 2.93GHz quad core PC. That’s amazing. please update us with some more infos!